Many people are under the impression that if they haven't made any serious money by the time they hit 30, it's just never going to happen. 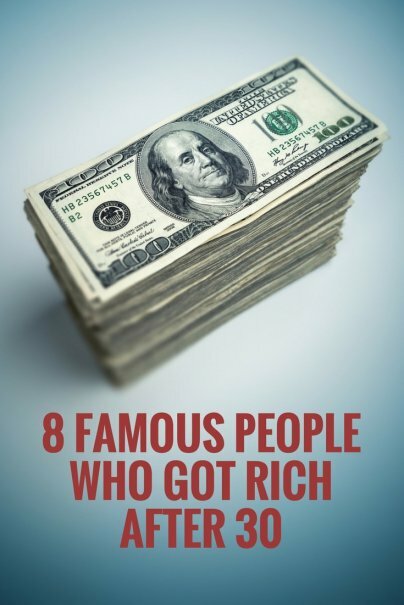 But as the following famous people can attest to, "rich" can be achieved well after you hit the big 3-0. Get ready to be inspired. You probably know the name Vera Wang even if you don't own any of her products. She's one of the most famous and lucrative fashion designers working today. But, she did not start out as a budding fashion designer in her 20s. In fact, she was a skilled figure skater who started the sport at just eight years old. In 1968, Wang competed at the U.S. Figure Skating Championships and was featured in Sports Illustrated. But when she failed to make the U.S. Olympics team, she turned her attention to fashion. After graduating from Sarah Lawrence, Wang was hired as an editor at Vogue, where she worked for 17 years. In 1987, she joined Ralph Lauren, and her brief stint there gave her the drive to go out into the fashion world on her own. Two years later, at the age of 40, she designed her first wedding gown. Since then, Wang has made gowns for a litany of famous people and her career has exploded. Vera Wang is now a household name and she has a net worth of $420 million. Who doesn't know Henry Ford? He is often considered the father of the modern automobile, having created an assembly line technique that revolutionized the auto industry. And while he didn't actually invent the car, or the assembly line for that matter, he did combine the two to make automobiles affordable for American families. However, this revelation did not come to him early in his career. After a series of experiments in his free time, Ford built a fully-functioning vehicle in 1898 at the age of 35. This eventually led to a partnership with Alexander Malcomson and a contract with the Dodge brothers. On June 16 1903, with $28,000 in capital, the Ford Motor Company was born. Five years later, in 1908, the Ford Model T was introduced to America. At a price of $825 (around $22,000 today), it was very affordable. Just 10 years later, when Ford was 55, half the cars in America were Model T's. The business had exploded, and he continued to build his empire. Ford was president of the company he had built well into his late seventies, and when he died in 1947 at age 83, he had a net worth of what would have been almost $200 billion in today's dollars, adjusted for inflation. That made him the richest man in the world by a long, long way. Recently immortalized in the movie The Founder, Ray Kroc is the man responsible for creating the McDonald's company as you know it today. At the age of 53, well into what many would consider the twilight years of their career, Kroc was selling milkshake mixers door-to-door. It was not a thriving business. However, when he discovered that brothers Richard and Maurice McDonald had purchased eight of his multi-mixers for their burger joint, he had to see the restaurant for himself. And what he saw changed his life. Kroc convinced the brothers to franchise their store and eventually bought them out for just $1 million each; a pittance considering the value of McDonald's today. Kroc innovated the chain restaurant, the real estate process that drives the McDonald's empire, and rolled out inventions like the Chicken McNugget and the Happy Meal. When he passed away in 1984, he had a net worth of over $600 million. 4. Donald Fisher, founder of Gap Inc.
Born in 1928 in San Francisco, Donald Fisher hardly had the career trajectory of a traditional fashion icon. After finishing school, he served as an officer in the U.S. Naval Reserve before becoming a cabinet maker. In 1960, at the age of 32, he started his own business renovating hotels and purchased the Capitol Park Hotel in Sacramento. This was to be a turning point in Fisher's career. He leased some of the hotel's retail space to Levi Strauss & Co., and after a poor customer service exchange involving the return of a pair of Levi's, he noticed something that was crippling the store; it had a limited selection of jeans. He suggested to Levi's that they open a store with a much greater range of sizes and styles, and they bought into it. In August of 1969, at the age of 41, Donald and his wife Doris opened the very first Gap store (so named because it served the "generation gap") and sold Levi's jeans, records, and tapes. It was a massive success. Just three years later, the Fishers launched their own Gap clothing label, and later went on to buy out Banana Republic and found the Old Navy chain. When he died, Donald Fisher had a net worth of over $3.3 billion. It's hard to imagine life without Netflix these days: instant streaming, incredible original series, and a massive library of movies all at our fingertips. But the man behind it, Reed Hastings, did not come up with the idea until he was 37 years old. Hastings spent the beginning of his career in the Peace Corps teaching high school math in Swaziland from 1983 to 1985. When he came back to the States, he went to Stanford University and graduated with a master's degree in computer science. He used his skills at a company called Adaptive Technology where he invented a tool for debugging software. From there, Hastings went on to found Pure Software in 1991, which focused on software troubleshooting. Just six years later, his company was acquired for $750 million; and Hastings knew just what to do with that money. After getting a $40 late fee on a VHS rental of Apollo 13, he came up with the idea of a monthly DVD rental business that had no late fees. You keep the discs as long as you want, return them, and get another disc in your queue. It basically led to the downfall of Blockbuster and Hollywood Video and the creation of a service that changed television and the movie rental industry. Hastings has a current net worth of $2 billion. Martha Stewart is one of the most popular household names in America, despite her brush with the law and a highly-publicized prison sentence for securities fraud. Ironically, after a career in modeling, Stewart was actually a stockbroker for some time. And while she was trading, she started a catering business in her basement with Norma Collier, a friend from her modeling days. After catering the book release of The Secret Book of Gnomes, she was introduced to Alan Mirken, head of a large publishing firm. He was so impressed by Stewart that he asked her to develop a book. Entertaining, ghostwritten by Elizabeth Hawes, was a success. From there, the Martha Stewart name started to take hold, with many more books in the series hitting the shelves. Stewart also made regular appearances on The Oprah Winfrey Show and Larry King Live. In 1990, the magazine Martha Stewart Living was launched, and three years later, her massive TV show based on the magazine took to the airwaves. Martha Stewart was 52 at that time. Now Stewart has a net worth of over $300 million. Born in Taiwan in 1910 to a wealthy family, Momofuku Ando was raised by his grandparents following the deaths of his parents. At 22 years of age, he started a textiles company. But after the end of World War II, he was convicted of tax evasion and spent two years in jail. His company declared bankruptcy. In the decade that followed the end of the war, Japan was suffering from a severe food shortage. The government was trying to convince its citizens to eat bread with the flour supplied by the U.S., but Ando thought noodles were a more obvious solution to this problem. After many months of trial and error, Ando, aged 48, perfected his prepackaged instant noodles. In 1971, at 61 years of age, he brought Cup Noodles to the market. Ando died when he was 96, and it was said he ate his chicken ramen noodles almost daily. His net worth was around $100 million. If you ever wondered why the Walmart warehouse chain is called Sam's Club, now you know. It was Sam Walton who started the massive Walmart empire, and it began in 1945 with a loan for $20,000. He was 44 years old at the time, and that $20,000 figure was no small sum. Adjusted for inflation, that's $250,000 today. He used the money to buy a Ben Franklin variety store in Newport, Arkansas, and three years later, he bought another. And then, another. By 1962, along with his brother Bud, he owned 16 stores in Arkansas, Missouri, and Kansas. In fact, 1962 was a banner year for Sam Walton. He opened the first true Walmart in Rogers, Arkansas — the Walmart Discount City store. Ironically, Walton was determined to market only American-made products supplied by U.S. manufacturers that could price their items low enough to meet foreign competition. These days, Walmart stores are stocked primarily with foreign-made items, something Sam would no doubt despise. He died in 1992 from a type of blood cancer, and the empire was taken over by his wife and children. His net worth was estimated at $65 billion.